With mobile traffic growing exponentially year on year (x4 in the past 12 months), it is more important than ever to start thinking about a mobile strategy when building out paid search campaigns. However, Adwords does offer features that enable you to target the type of device you want: Desktop/Laptop computers versus Mobile devices. In the article below, I will expose a few techniques that you should keep in mind when building Adwords campaigns targeting mobile devices. Make sure you have a mobile version of your site. This is the first and most important step. There is no point on working hard to send traffic to your mobile site if that traffic doesn’t convert because your site is not mobile-friendly. Some services such as mobify.me can make your site mobile-friendly, or even transform your e-commerce site to a m-commerce site. If you are using WordPress, Blogger or other platforms, you can find plug-ins that do all the work for you. For example, Reef Digital is using WPtouch for WordPress. Have a look at your Google Analytics traffic. Is mobile traffic a big part of your audience? Is it increasing? Are they converting? If their conversion rate is lower than from other traffic sources, you might want to optimise your website for mobile traffic, which confirms you need to start by step 1. If you are using Adwords, make sure your existing campaigns only target ‘Desktop and laptop computers’. 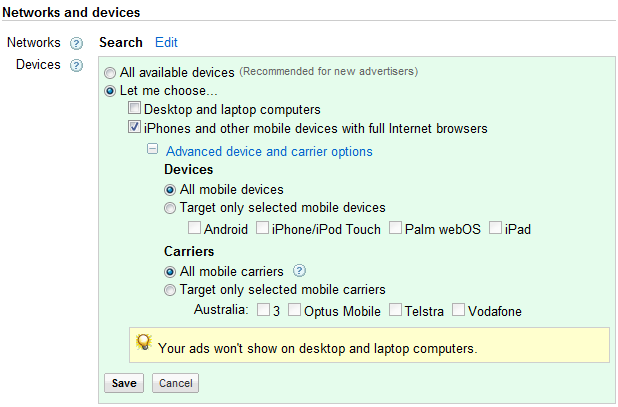 By default, Adwords will select ‘All devices’, which means even mobile phones will click on your ads and cost you money while chances are they will bounce out rapidly if your site is not optimised for them (see screen-shot). Build separate campaigns to target mobile devices. Read below if interested in doing so! Login to your Adwords account and create a new campaign. This campaign will be your mobile campaign. Head to the Campaign Settings tab and expand the Networks and devices section (see screenshot below). Untick ‘Desktop and laptop computers’ as you do not want your mobile campaign to target those. You can target them through other campaigns that you may already have. You can also target users by the type of mobile device they are using (Android, iPhone, Palms, iPads), as well as the carrier (different carriers will show depending on your campaign level geo-targeting settings). Choosing the right keywords is important for one big reason: Generating relevant impression volume! Search terms on mobile devices are different than on normal computers. Mobile handsets are not ideal to type with and many people will shorten their searches. Mobile searches are mostly made up of 1 or 2 words, sometimes 3. But they rarely go above 3. This is something to keep in mind while building the keyword list in your adgroups. 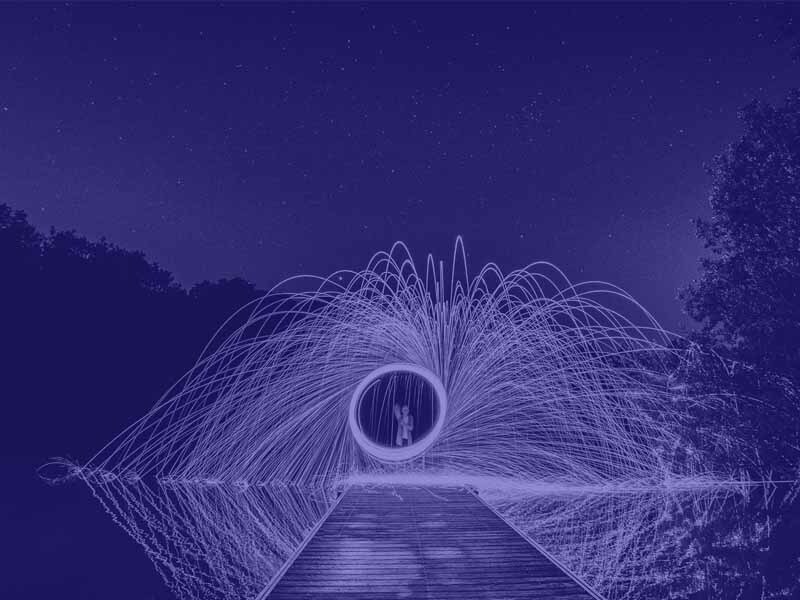 There is not point of having hundreds or thousands of long-tail keywords that will most likely never receive an impression on a mobile device. 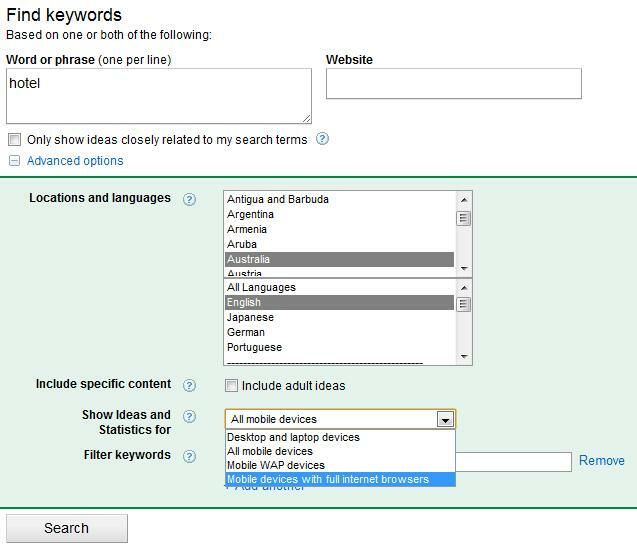 So, how do you choose your keywords on mobile? I suggest you choose either option 2 or 4 depending on if you want to include WAP devices (which are rapidly declining). Once you have your keyword list, you may move on to the next step. On full-browser capable mobile devices, Adwords ads follow the same format as on normal SERP: 25 characters for the headline and 35 characters for the decription line 1, description line 2 and display URL. What you want to write in your mobile ad is entirely up to you. But there are many ways to be creative. Eg. You can create a campaign that targets Androids only devices and write “Android-friendly site” somewhere in your ad copy. And do the same with an iPhone campaign.. You should normally see your CTR go up. 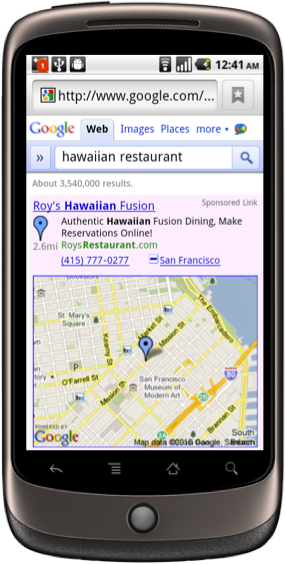 Lastly, don’t forget your destination URL should be pointing to your mobile site! 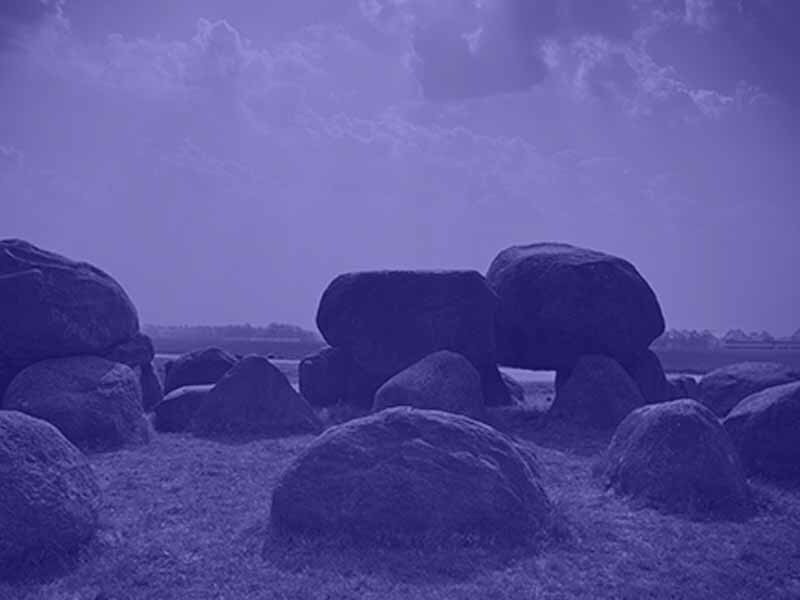 Start building your very own mobile strategy. Adwords should enable you to reach great results, providing you do things right. Remember, paid search is about testing and learning, and testing, and learning. The mobile advertising industry is evolving really fast and more features will come soon to Australia. For example, click-to-call actions, Google Places ad extension, etc (see screenshot below). Google has also bought the admob mobile advertising platform. Give it a try as well if you want to play around with mobile ads. It’s more fun that you think! What about you? Have you been targeting mobile devices successfully? Share your thoughts and experience!